The first phase of the 350 campaign has been a wild success. 350 is now an international symbol of emergency climate stabilization. More importantly, the 350 target reflects a scientifically-grounded assessment of what global climate protection really means. But what would it actually take to bring the atmospheric carbon-dioxide (CO2) concentration back to 350 parts per million? This memo provides a quick, up-to-date overview of the issues here, which are significant to any plausible emergency emissions-reduction effort. It focuses on the extremely limited size of the global CO2 budget that would remain to us in a 350 ppm future, and on the shape of the emissions pathway that’s needed if were to keep within that budget. 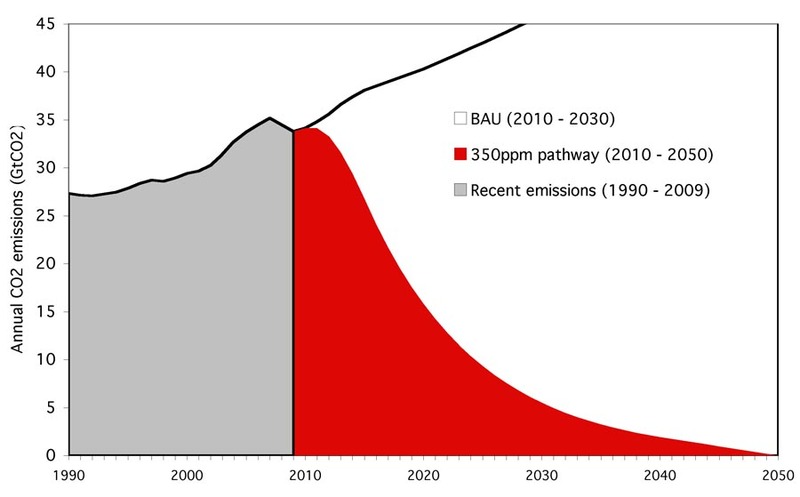 In particular, it specifies a representative emissions pathway consistent with a 350 ppm concentration target. By way of context, it then compares this 350 pathway to an emission pathway consistent with a 2C temperature target, and to other, supposedly 2C-compliant pathways that have significantly lower odds of actually satisfying their target. Finally, it offers a brief glimpse of the challenges that all true emergency climate-reduction targets raise in this North / South divided world. The pathway is derived from the core 350 pathway developed by Jim Hansen’s team, and, critically, it is updated to take account to the 2007-2009 global emissions decline that came about with the “great recession.” Moreover, it is based on the milestone methodology published earlier this year in Nature (see our discussion and links here) by a team led by Malte Meinshausen at the Potsdam Institute for Climate Impact Research, which established cumulative emissions budgets as the best predictors of success for any given global emissions pathway. This is a good paper, if we do so say ourselves. And the folks at www.350.org, who instigated it, agree — they are distributing it widely.